Only 22 players (11 pairs) for the post xmas pairs betterball competition, which was again played in brilliant boxing day sunshine, although the players did suffer from a little wind (was it those sprouts yesterday?). Neil Simpson again came out on top (for the 7th time in 2014! ), but amazingly only figured on the scorecard once. Partner Chris Page (current handicap 24.5) shot a net 59 with his own ball, which is remarkable, although it must be said that the men were still playing off the ladies tees. Unfortunate for the ladies who gained no such advantage. president Kevin with the winners Chris and Neil………….. However all were winners. Dave Cooke brought over 18 boxes of calloway warbird balls which he had over from this year’s corporate sponsorship (Belting Service Ltd). He gave each player on the day a sleeve of 3 balls – a very nice gesture. We still have lots left, so we will used them as prizes for achieving a 2 in a Friday competition. Each two will earn a sleeve of balls. 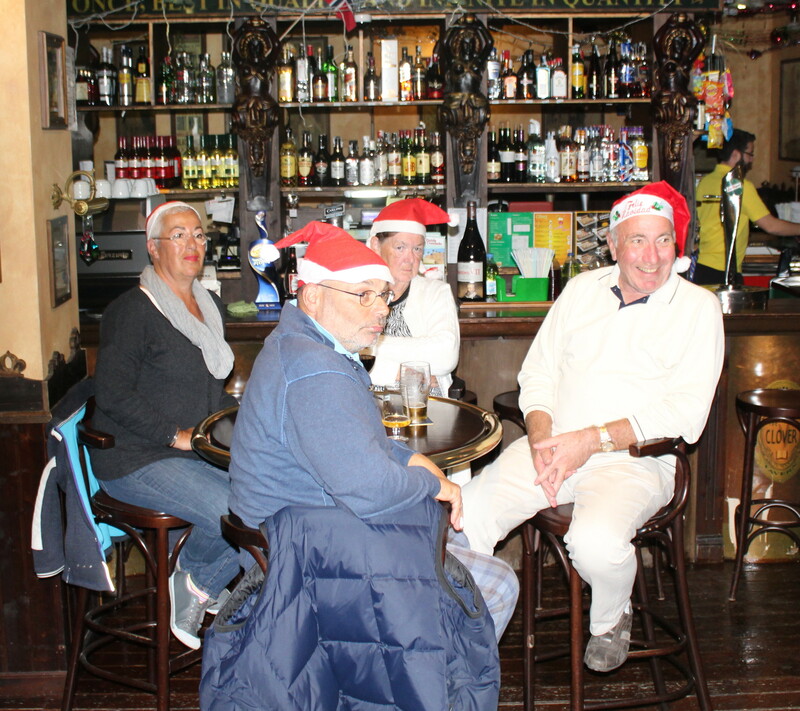 It was also free to enter, and at the presentation each golfer received a wrapped bottle of xmas spirit! IRM have released their prices for 6 course membership. As before the 8€ green fee will be waived during the 5 months low seasons. Also the prices for 3, 6 and 12 months membership will remain the same as last year. Police from Northumbria have asked the public to keep an eye out for David Lloyd, who also uses the alias of Tom Jones. A recent search found him in the little known urbanisation of Condado de Alhama in Spain. He was extradited back to the UK after many residents tipped off the police about his strange and erratic behaviour. He was known to be the ringleader of two gangs. The Benidorm gang had six undesirables. Les ‘Five Bellys Hurren; ‘Kev ‘Happy’ Smith (not because he is happy – because he is a dwarf); Baz ‘The Cleaver’ Barker (swings a golf club like a meat axe); ‘Killer’ Kenny Saunders (also being sought for 2 killings near La Pinilla), and Phil ‘The Banker’ (is that spelt right?) Tann who keeps all the loot (sharing it out very infrequently) and who was in charge of transport (helicopter, quads etc). He even stole a police dog on one job and Sam the Sniffer changed sides for a pork chop. His other gang was Delilah & the pussycats. He was ‘Delilah’ (don’t know why), Kim (I would kill for a cup of tea) and Alicia, who was involved in the double ‘hit’ in La Pinilla with husband ‘Killer Kenny’ (a cop turned robber). the gang look like this on a job…..maybe a mask would help?……. He has now been reported missing on boxing day from the Gallowgate mental facility in Newcastle. It is thought that he had just seen Geoff Stelling giving the football results (Manchester United 3 Newcastle United 1) and this tipped him over the edge. we have CCTV of him shortly before his escape (see the link below). Another possibility is that he may have missed his medication, which causes him to think he is a zebra. Below is a photograph of David in happier times with his medication. It is suggested that he may be enticed back into captivity if you stand well back and leave a couple of newcastle brown stomach settlers within reach. If anyone sees him, do not approach him or he may burst into song (he does like an audience). When he is apprehended he will be given the right to remain silent (indeed it will be compulsory), and anything he says (or sings) will be completely ignored. Following on from last week, here is the second link of the course being filmed from above…………….. Since October 2013 the golf society has been electronically storing the results of all Society qualifying matches. We therefore now have sufficient statistical data to enable us to carry out an annual handicap review for those members that play regularly at Condado as mandated by the EGA. ( 3.4.8 & 3.15 ). On Friday 12th December the last qualifying match of 2014 was played so now is the time to carry out the review before the new year. During 2014 the society played 47 qualifying matches in which 521 society members participated. Given that the Society membership currently stands at 710 some 189 members never played in any of the years individual events, all these members should be marked as inactive within the golf society and a new proof of handicap will be requested when/if they rejoin the society in 2015. As stated in appendix C of the EGA rules 8 qualifying results are required for inclusion in the automatic review process, taken from the current and preceding year if required, this therefore excludes 92 of the 159 players from the review, for brevity I will not list these members. I have also excluded this players where as a result of the review no change is required or where such a change would increase there handicap over the maximum. Kevin and Ian got into the festive spirit……..
23 players on Friday for the Christmas frolic, which was played in brilliant sunshine and no wind. Mulled wine on the first tee, alas no mince pies due to a misunderstanding. We got those later in the Clover. We did intend to play the competition from the white tees, but the greenstaff decided to re-seed the white and yellow tees, so we had to play from the ladies – which made it very different finding our drives in previously unknown positions! close behind and winner of the 1st division was Jan………. Phil is getting into a regular contender, maybe his handicap will soon come down. As a fun competition each player was allowed one throw, to help them out of trouble. Maybe this seemed a little complicated to some, as one player’s free throw finished in a bunker! Also Julia Gibson (8 handicap!) hit the green with her tee shot on the par 3 11th. After taking 3 putts and still not holing out, she picked up her ball and threw it in the lake! This was a gross miscalculation, as she had a tap in for a point! At the presentation there was a festive atmosphere with every player getting a gift from Santa (who looked familiar!). If there was a fashion competition, Ian Whyte would have won it hands down, with his xmas tree hat taking root on his head by the finish! Kev came a close second with his elf impression. Neil did the honours as compere, thanks for the donated drinks vouchers for the winners. 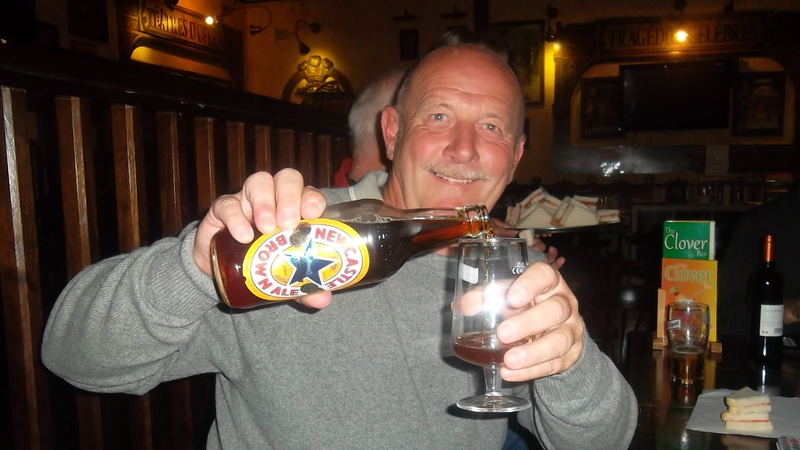 once you give Neil a mic on the stage you can’t get him down…..
after match drinks with Torild, Phil, Kev and Neil……..
A good opportunity to get a photo call with our friends Julia Gibson and Karen Simpson from the Wirral – no it’s not Liverpool, it’s Cheshire! Just one more competition left this year, a betterball pairs where all players bring a wrapped bottle to the Clover (no sweep). Blog finished, but here are some photos of the day provided by Ian Whyte’s wife, Liz. Only 8 degrees when we teed off, but clear skies, and players changed from jackets and trousers to tee shirts and shorts as it warmed up. Only 27 players today, the site is very quiet in the build up to Christmas. Although conditions were good, not one player reached 36 points. Peter Ridley just got over the finishing line with 35 points, beating Graham White on a back 9 countback. 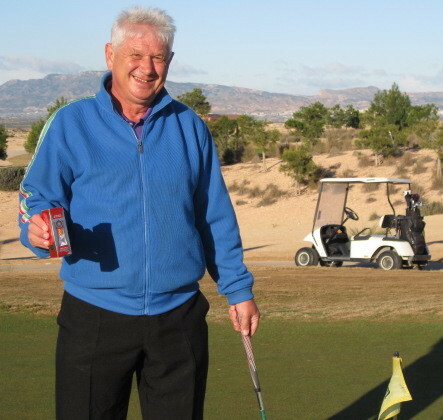 An interesting point though, all 3 winners of the 1st division, 2nd division and ladies division have had lessons this week with Stephen McOmish, the professional at Hacienda Del Alamo (Peter Beatt has won the previous 2 weeks after lessons with Stephen). I would personally recommend him, considering I have finished last in a couple of recent competitions, and 30 points was a distant dream! I have had to improvise with the photos of the winners, as I had to stand in for Dave Lloyd in assisting the captain in making the presentations – couldn’t be in 2 places at once so had to dig these out of the archives…………. Perhaps the cold did get to us – after hitting the green on hole 17, I drove round to the 18th tee and was waiting to tee off after Ken Saunders and Dave Storey, when I realized I hadn’t played the previous hole yet! Another senior moment on hole 8, when my magnetic ball marker kept falling off its clip on my cap. After 3 attempts I realized that I already had a marker on the clip! Jostein Landsvik and Jim Alwell also looked like the had had enough on 17, with the bar in sight! Next week is the christmas stableford, off the white tees for men and yellow tees for ladies. It is harder, but the slope allowance will be higher. Will all players bring a wrapped Xmas present to the Clover (value aprox 5e), and everyone will get a prize from Santa! This weeks competition was teams of 4 with 3 scores to count at each hole. 28 players formed 7 teams, and the weather was superb, 18 degrees and a cloudless sky. captain Dave Rollett plays his shot for par at hole 11…………. 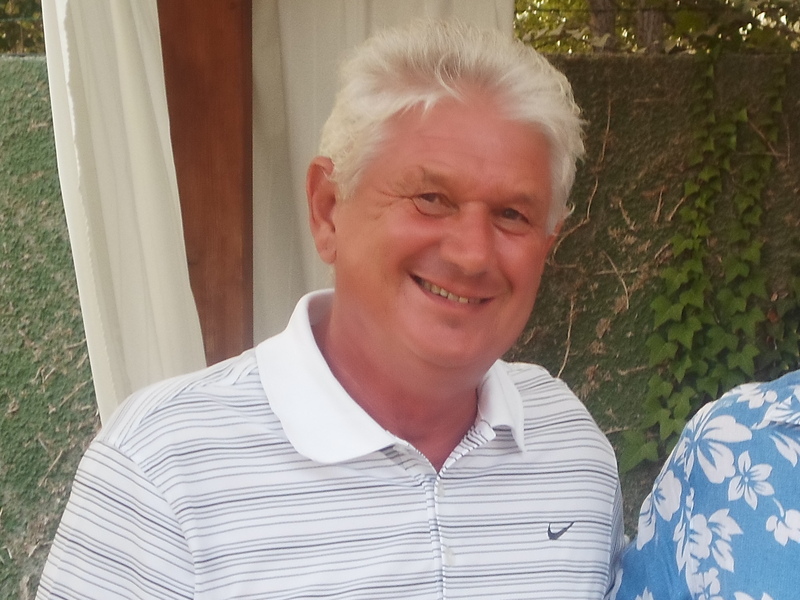 Last week I talked you through Mick Parson’s escapades on hole 10…………..what a difference a week makes! At the other end of the spectrum he holes out on hole 11 for a 2, and 5 points. Mick’s putt about to drop for the only 2 of the day……. Jostein Landsvik also holes his putt for a scrambled 3…………. Ray Rollett strikes a fine pose with his drive at hole 12…………..
Next week is the final Apollo Air competition of the year. We are pleased to announce that they will continue their sponsorship throughout 2015. Check out the fixtures tab on this page – all next years competitions are now on. We have just received news about the hollow tining – it will be on Monday, Tuesday Wednesday May 25th/26th/27th. This does not affect our Friday competition (4 person yellow ball),but it is possible we may play away to give the course time to recover (the following week it will be Dave Lloyd’s captains day).